Sir Toby Jingle was a knight who had done every brave thing from jabbing giants to trouncing trolls. Year and after year ghastly creatures would slink out of Grimghast Forest and terrorize the peaceful villages. And year after year Sir Toby would send them howling and limping back. In time the creatures came to think he had magical powers. When he heard of these preposterous imaginings, Sir Toby would laugh, for he knew his success was due to the skill of long practice and his sharp wits, nothing more. ...but the dude is getting old, old, old! 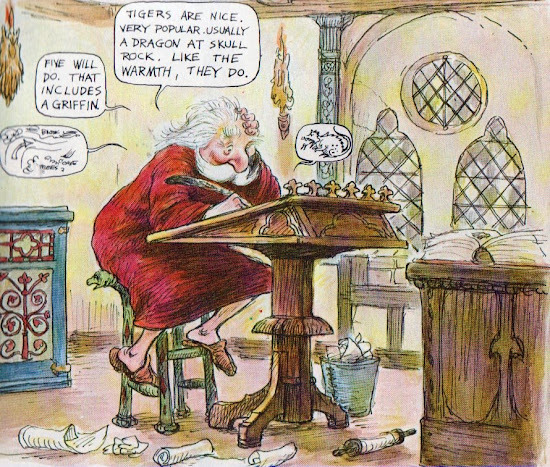 Too old, in fact, so he sits down at his desk to plan his last adventure. 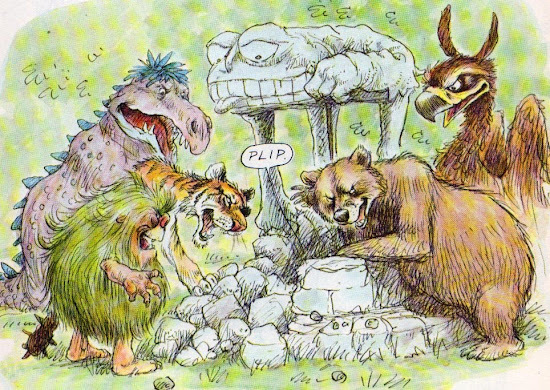 In the pages that follow, he outsmarts the aforementioned griffin and ogre as well as a bear, a one-eyed tiger and a dragon.... and in turn, sets up a rather ingenious retirement plan for himself. The perfect adventure book for a rainy day. Sigh. "Stand Back," Said the Elephant. "I'm Going to Sneeze!" Hey, Scribbler. 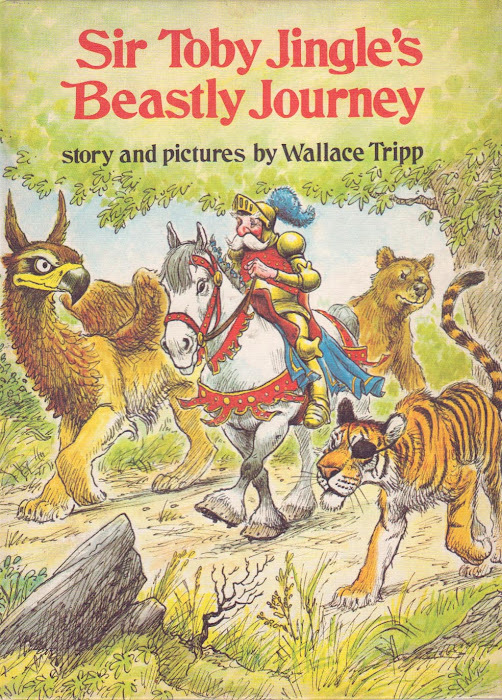 Sir Toby Jingle's Beastly Journey is a great book. I remember finding it in my school's library when I was probably too old to be looking in the picture books section and I loved it. I kept the book out of circulation for a better part of the year. Anyway, I found your site through BoingBoing and have been meaning to tell you for a while I enjoy your reviews very much. Thank you. By an incredible coincidence, I happened to look this book up on the Internet today -- and here's a lovely review. I'm fond of it too. But I would be-- I'm the Benjamin in the dedication, Wallace Tripp's son. And, am impressed by the coincidence here above. Also, because I suddenly remembered, I had sent you a review of this elephant book when you asked for guest reviews - did you get it or did it land in your spam bin? no way swati! that's awesome... let me check my spam now! I'll let you know! 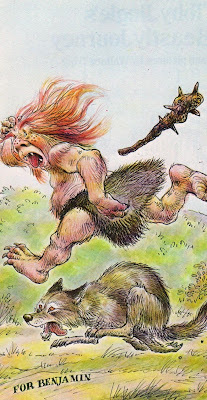 trippgallery.com has original sketches and a few out of print books in mint condition by Wallace Tripp...enjoy. Great Monday Give: Hooper Humperdink...?